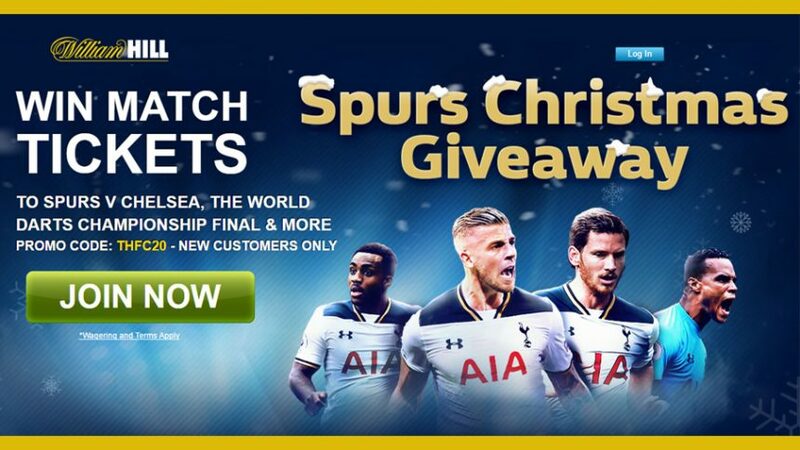 Watch the London derby between Spurs and Chelsea live at White Hart Lane with William Hill’s Christmas Sports Giveaways! All you have to do is open a new account with William Hill Sports before December 23 and you’ll be eligible to enter the raffle draw that can see you scoop Premier League tickets to White Hart Lane on January 4, 2017. Please use the following Bonus Code for the Christmas Sports Giveaways Offer: THFC20. But wait, there’s even more prizes up for grabs with Christmas Sports Giveaways! William Hill gives you the chance to unwrap another present in the form of a package for the William Hill World Darts Championship Final event, scheduled for January 2, 2017. We know you might get tired of receiving lots of cool present the Christmas Sportso Giveaways, but bear with us for a little longer please; you can also win a signed Spurs shirt from the new campaign (2016/17) and even a signed dartboard that combines your love for football and darts at the same time, just in time for the December festivities. This all can be yours if you enter the raffle for the Christmas Sports Giveaways on time; make the best of today by joining the online sportsbook now and opening up a new account for a chance to win match tickets to Spurs v Chelsea game and other great Xmas presents. Both the Spurs v Chelsea match package and the World Championship Darts Final package include the following: two general admission tickets, £50 food and drink vouchers (in case you get hungry), accommodation and UK travel. Oh, let’s not forget that the standard Welcome Offer ‘Bet £10, Get £20′ is valid in addition to the special Christmas Sports Giveaways Offer, so make sure to collect it on your way to White Hart Lane. The raffle draw is set to take place on December 23, so watch out to find your name next to a pair of tickets to the Spurs’ home ground. Join William Hill Sports before December 23 and participate in the raffle draw to win tickets to White Hart Lane for Spurs v Chelsea and other Xmas gifts with Christmas Sports Giveaways! Get your tickets now with Christmas Sports Giveaways!